Databases tend to hold an organization’s most important information and power the most crucial applications. 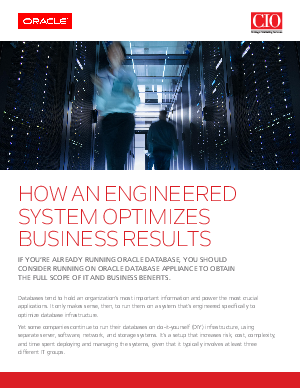 It only makes sense, then, to run them on a system that’s engineered specifically to optimize database infrastructure. Yet some companies continue to run their databases on do-it-yourself (DIY) infrastructure, using separate server, software, network, and storage systems. It’s a setup that increases risk, cost, complexity, and time spent deploying and managing the systems, given that it typically involves at least three different IT groups.